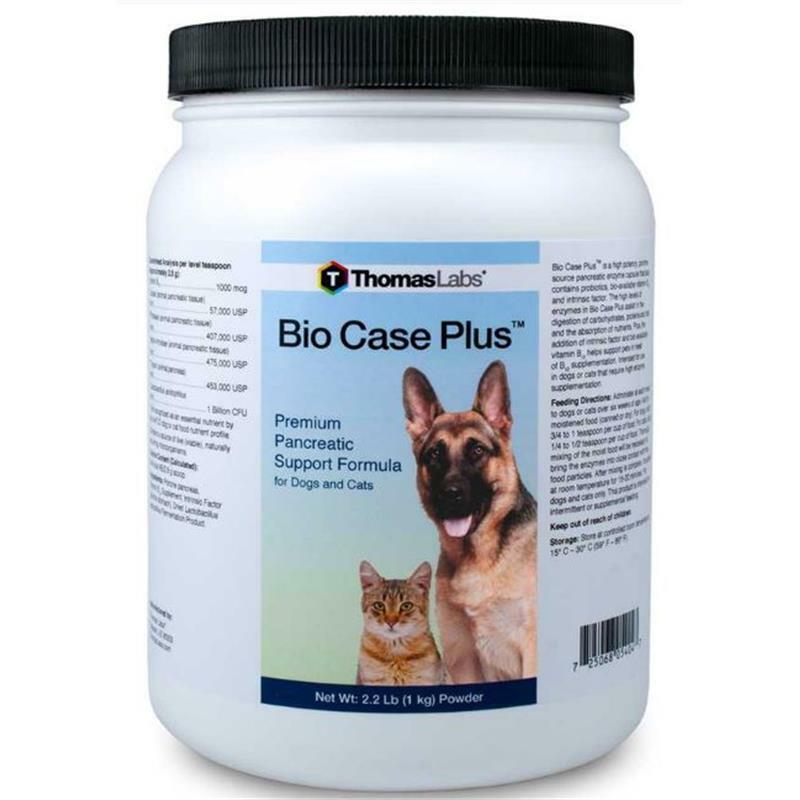 Bio Case Plus is a high potency, porcine-source pancreatic enzyme powder designed to support a dog or cats digestion of carbohydrates, proteins and fats and assist in the absorption of nutrients. It is intended for dogs and cats over six weeks of age that require high enzyme supplementation. 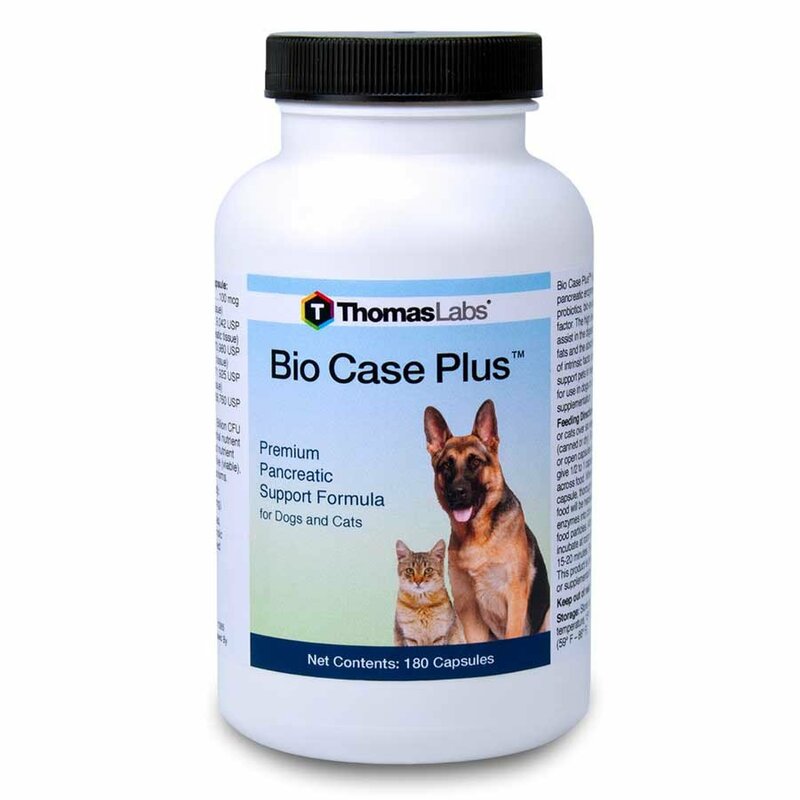 Bio Case Plus contains higher levels of pancreatic enzymes than the original Bio Case. In addition, it contains probiotics, bio-available vitamin B12, and intrinsic factor to help support pets in need of B12 supplementation. 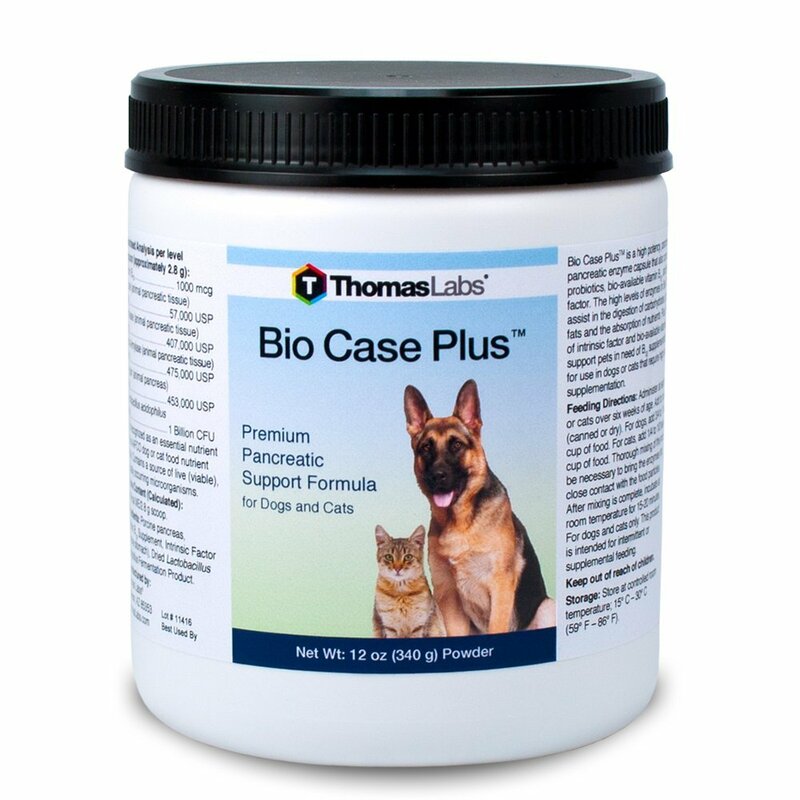 When your friend is feeling a little down, and you want to get him back up and around, choose Bio Case PlusTM from Thomas Labs! Even dogs and cats get a little uncomfortable from time to time, and when they get that grumbling going, you know it’s best to get them feeling better fast! Bio Case is a high potency, porcine-source pancreatic enzyme powder formulated for use as a digestive supplement to support enzyme replacement needs. The high levels of enzymes in Bio Case assist the pancreas in the digestion of carbohydrates, proteins and fats. By supporting the absorption of nutrients in your dog or cat’s digestive system, Bio Case helps your hungry friend get the nutrients he needs from his food—and he will still be ready to play afterwards. When your friend is feeling a little down, and you want to get him back up and around, choose Bio Case! Administer at each meal to dogs or cats over six weeks of age. Add to moistened food (canned or dry). For dogs, add 3/4 to 1 teaspoon per cup of food. For cats, add 1/4 to 1/2 teaspoon per cup of food. Thorough mixing of the moist food will be necessary to bring the enzymes into close contact with the food particles. After mixing is complete, incubate at room temperature for 15-20 minutes. Administer at each meal to dogs or cats over six weeks of age. Add to moistened food (canned or dry). For dogs, give 2 to 3 capsules orally, or open capsules and spread across food. For cats, give 1/2 to 1 capsule, or open capsule and spread across food. When opening the capsule, thorough mixing of the moist food will be necessary to bring the enzymes into close contact with the food particles. After mixing is complete, incubate at room temperature for 15-20 minutes.